Facebook (FB) is currently on pace to have one of its worst trading days as a public company on Thursday after releasing a disappointing earnings report after the close Wednesday. The culprit for the weakness was disappointing revenue and user growth, and based on the fact that the stock hit an all-time high right before the release, investors were more than caught off guard. The fact that as recently as Wednesday morning there were reports that the quarter would be strong based on strong partner checks shows just how surprised many investors were by the Q2 report. Subscribers to the Bespoke Consumer Pulse report from Bespoke Market Intelligence were aware of the underlying weakness in usage trends, though. 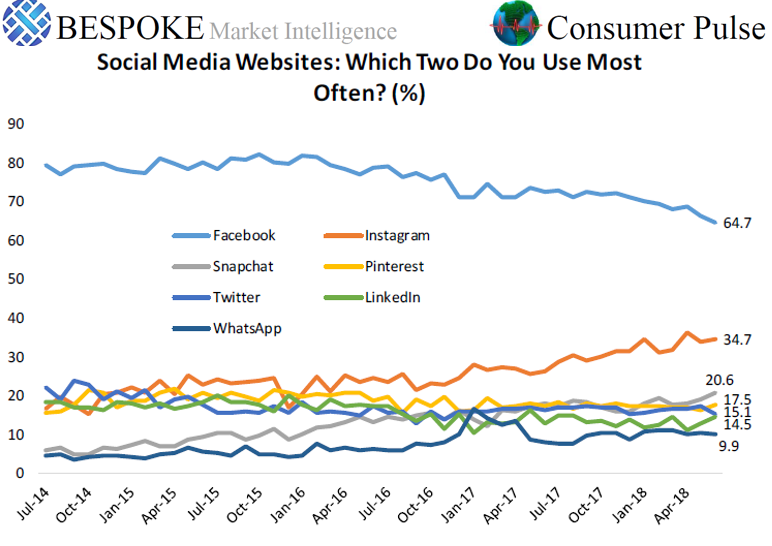 The chart below was taken from our most recent report for the month of June and was derived from a question where we asked consumers which two of the major social media websites they use most. While Facebook (FB) is still far and away the leader at 64.7%, usage has been steadily trending lower for a couple of years now. The big saving grace for Facebook (FB), though, has been strength in Instagram where usage had been steadily trending higher. The problem here is that growth in usage for Instagram has also shown signs of leveling off in the mid 30% range. Even usage of WhatsApp has been stuck at or below 10% for a number of months now.